My opponent won the roll off to deploy objectives first. The objectives were placed in the same order as their numbers (my opponent placing the odd ones and me placing the even ones). My opponents army is very mobile and has strong shooting. My army on the other hand is slow, resilient and has the ability to deploy with pinpoint precision. Realistically I’m not going to be able to catch my opponent unless I manage to sandwitch his army between my two grotesque units. However that would depend on both my grotesque units coming in from reserve on the same turn (44% chance of happening on turn 2). With the ability for the serpents to redeploy 30” in a turn and their 60” range shields this seems like too much of gamble. I’m going to have to play the mission. I decide to try to cluster as many objectives around his initial objective and ensure that between those four objectives is a piece of terrain/cover that my army can hide in. With 3 objectives bordering the cover I might be able to get a mysterious objective that can fortify my position. My opponent wins the roll off for picking table halves and chooses the side with the cluster of objective markers in the deployment zone. He knows I’m not going to be scoring many objectives turn 1-2 so wants to get ahead on the mission. I win the roll off for deployment and choose to deploy first. I deployed the talos out of sight behind a bastion on an objective. 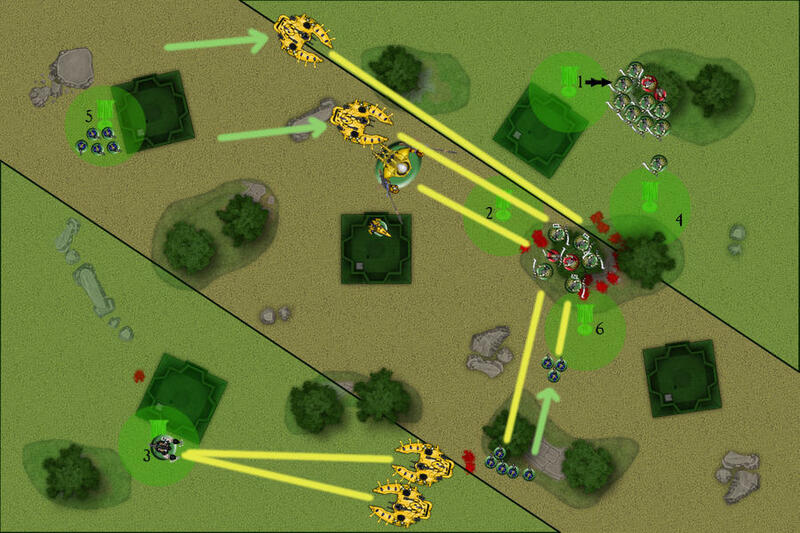 In response my opponent deploys spread out allowing his army to disperse and spread so that they can run rings around my slower force. I decide to go second as it will rob my opponent of at least one turn of shooting against my reserves. Tactical Objectives: No Prisoners (1VP for destroying a unit, D3 for destroying 3 or more units), Secure Objective 1, Secure Objective 2. My opponent draws his tactical objective cards. He repositions his army to secure Objectives 1 - Nothing of Note and Objective 2 - Scatter Field (+1 to cover saves). He summons some daemonettes in his psychic phase. The rest of his army disperses to try and flank my Talos. Objectives 4 - Sky Fire Nexus (allows controlling unit to skyfire) and Objectives 5 - Grav Generator (-2” to the charge move of units trying to charge the controlling unit) were also uncovered. First Hand Tactical Objectives: Assassinate (1VP for Killing a Character), Overwhelming Firepower (1VP for destroying a unit with shooting), Kingslayer (D3 VP for killing the warlord). Second Hand Tactical Objectives: Secure Objective 4, Secure Objective 3, Witch Hunter (1VP for killing a psyker). After drawing a terrible first hand considering my opponent army (A warlord I will never catch, and mechanised units I can’t kill in the shooting phase) I use my warlord trait to discard those cards. Not only does this give me a second chance but it also puts those cards out of the game meaning I won’t be able to draw them again, a good thing. My second hand is much better. The talos scoot to the other side of the bastion to avoid some incoming fire. The talos further back hangs back to score Objective 3 - Nothing Of Note (misrepresented in the diagram in the game he was just within 3” of the objective). At the end of my turn I discard the Witch Hunter tactical objective as I’m unlikely to be able to score it (again discarding it puts it out of the game meaning it can’t be redrawn). 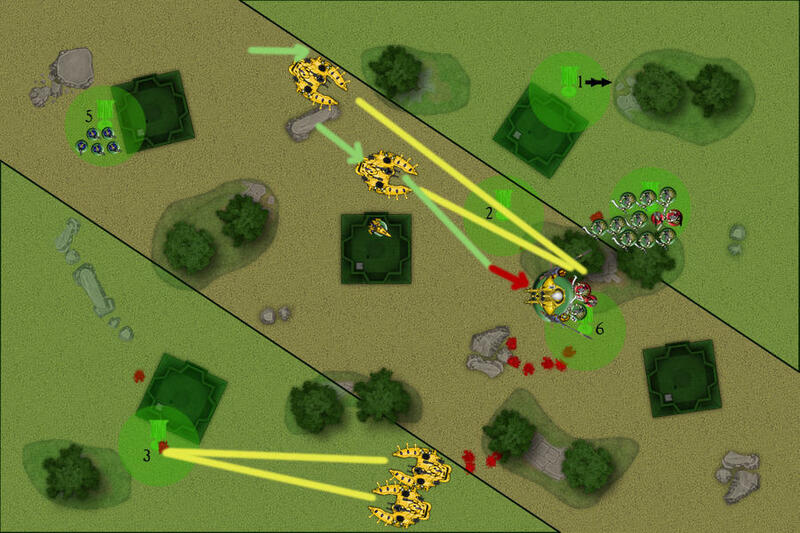 Tactical Objectives: No Prisoners (1VP for destroying a unit, D3 for destroying 3 or more units), Big Game Hunter (score 1VP for killing an MC), Score Objective 2. 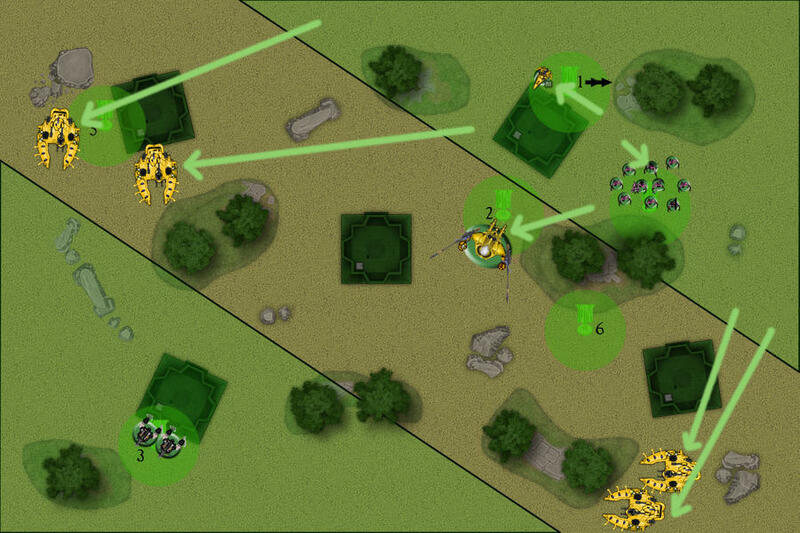 The daemonettes spread out to contest Objective 4 and Objective 6 - Targeting Relay (re-roll ones to hit in the shooting phase). The Wraith Knight scores objective 2. The fire dragons and dire avengers disembark from the serpents on the right who then move back. The farseer casts guide on the dragons. They all engage the talos, killing one and scoring the Big Game Hunter tactical objective. I draw Death By A Thousand Cuts. My Warlord's unit of Grotesques arrive from reserves and I deploy them in the forest between the clustered objective (they take one wound from dangerous terrain). They use their run move to spread out. The Talos play hide and seek with the wave serpents on the right by moving to the other side of the bastion. I can’t score objective 2 or 4 as one is contested by the daemonettes and the other by the wraith knight. I discard Death By A Thousand Cuts as I am unlikely to score it. Tactical Objectives: Overwhelming Firepower (score 1VP for killing a unit with shooting), Secure Objective 6, Secure Objective 5. The Eldar forces reposition, the dire avengers disembark from the two wave serpents on the bottom left. The two wave serpents fire into the Talos inflicting a single wound. The farseer presciences the wraith knight and guides the dire avengers. The rest of the Eldar Army fire into the grotesques killing two and inflicting wounds across the unit (though the grotesques get +1 to their cover save from Objective 2 being a Scatter Field). 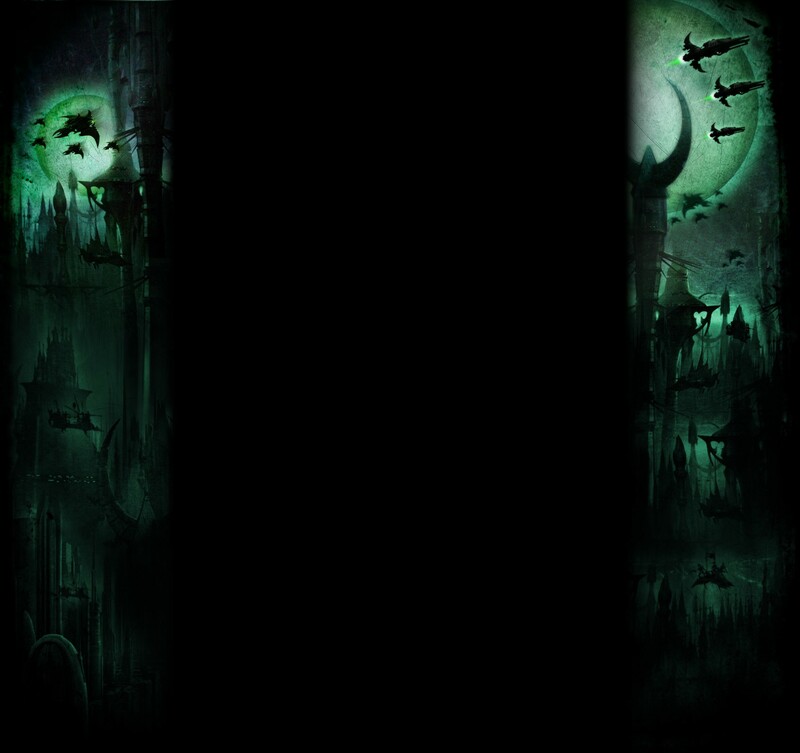 The Dire Avengers in the top right corner score objective 5. Tactical Objectives: Secure Objective 4, Secure Objective 2, Behind Enemy lines (1VP for having a unit within 12” of your opponents deployment edge). I draw the Behind Enemy Lines tactical objective. The second unit of grotesques arrives from reserve and are deployed so that they can score Objective 4 and Behind Enemy Lines. The Talos fires its splinter cannons at the Dire Avengers killing two (they do not fail their morale check). The other grotesque unit charges the daemonettes taking a few wounds and killing them all for First Blood. They consolidate onto Objective 2 and re-shuffle so that the injured grotesques can regenerate with It Will Not Die. Objectives 2, Objective 4, Behind Enemy Lines and First Blood were scored this turn. Tactical Objectives: Overwhelming Firepower (score 1VP for killing a unit with shooting), Secure Objective 6, Blood and Guts (1VP for destroying something in assault). The two wave serpents at the bottom fire into the talos again only inflicting one wound! The Farseer Guides the Wraith Knight, however I manage to deny it. Everything fires into the grotesques. Killing and wounding a few more. The Dire Avengers that are down to three models, run forward to score objective 6 (as they are objective secure). The Talos fires into the five man Dire Avenger squad at the bottom left, killing two, they break and flee towards the grotesques (scoring Psychological Warfare). The healthy unit of grotesques runs into the woods. The Badly damaged units of grotesques multiple charges the two dire avenger squads (the fleeing squad rallies). Both squads are destroyed in assault (scoring Pain in All its Forms and No Prisoners). The grotesques consolidate back into cover as best they can and regenerate a few wounds thanks to It Will Not Die. Tactical Objectives: Overwhelming Firepower (score 1VP for killing a unit with shooting), Behind Enemy Lines (1VP for having a unit within 12” of your opponents deployment edge), Blood and Guts (1VP for destroying something in assault). The wave serpents at the bottom table edge finally destroy the Talos (scoring Overwhelming Fire). The Farseer cast prescience on the Wraith Knight. The rest of the Eldar forces shoot into the badly damaged unit of grotesques killing a few however Eternal Warrior has kicked in making the Wraith Cannons a lot less effective. In an act of desperation the Wraith Knight charges the 3 surviving grotesques and the haemonculus to try and score blood and guts. They inflict three wounds and take three in return killing a grotesque. Behind Enemy Lines is scored by the Wave Serpents. Tactical Objectives: Ascendancy (D3 VP for controlling 3 or more objectives), Secure Objective 6, Secure Objective 4. I draw three tactical objective cards. The haemonculus leaves the large grotesque unit in order to secure objective 4 (a unit can only secure one objective at a time). The Grotesques move over towards objective 2 and charge the wraith knight. The wraith knight attacks the aberration and haemonculus, but I allocate the wounds to the haemonculus and look out sir when he is down to one wound leaving them both on 1 wound each. The large squad of grotesques drowns the wraith knight in flesh gauntlet attacks (re-rolling to hit thanks to Zealot). They then consolidates onto objective 2. Scoring ascendancy, Objective 6 and Objective 4 for a total of 5VP. The game ends. Eldar score line breaker. a couple of objective cards that went your way but you played a very good game keeping to the mission and not bothering to go for the things you couldnt get like slay the witch. How do you think you would have gone if the game had gone on for another turn or 2? That was impressive. I was certain you'd get crushed in a Malestrom game due to your relative lack of mobility as compared to your opponent. Good job on sticking to your plan of playing to the mission and taking what your opponent and the cards gave you. I'd be curious to see how you would expand out your list to 1850 or 2000 points. Also, is it just me or is bringing four Wave Serpents to a 1250 friendly game borderline over the top? We actually played on to see how it would play out had the game not ended (I often do this as I find you can learn a lot from it time permitting of course). I'll put up the extra diagrams when I find the time, seeing as you are interested. That was impressive. I was certain you'd get crushed in a Malestrom game due to your relative lack of mobility as compared to your opponent. Good job on sticking to your plan of playing to the mission and taking what your opponent and the cards gave you. Yeah, playing the mission and forcing your opponent to come to you is key. Especially with a slow army. Objective placement and patience pretty much won me the game. I'd be curious to see how you would expand out your list to 1850 or 2000 points. Probably some more Talos, maybe corpse thief, or another 10 grots. Its his tournament list I asked him to bring it. That Eldar list is monumentally filthy. It's pretty much the absolute antithesis of fun... 4 serpents, a wraithknight, and a cheddarseer (with Malefic Daemonology, no less). Nice report. You list did a lot better than I expected. - It seems like those two Wave Serpents at the bottom should have been shooting your grotesques rather than your Talos. I mean, their guns would have been a lot more effective against them (especially the S7 Shield with Ignores Cover), and wiping out that squad would have both reduced your ability to score objectives and also netted him a Warlord kill. In contrast, the Talos wasn't really doing anything and could easily have been ignored (or handled by the Wraithknight). Congratulations, anyway. Nice to see coven doing well. Last Maelstrom game I played (Vs Orcs) I had a Huge advantage and he still won due to lucky card draws. Tho your list is very good at holding objectives I wonder how well it would do with a more Obj Sec list? Indeed. It's a pretty brutal list, the shooting damage output from it is just mental. So I'm quite proud my little gunless slow assault army managed to take it on. Hind sight is always 20/20. Also things are not always clear cut. For example I got first blood because he used the demonettes to prevent me scoring objectives on Turn 2. Seems like a mistake. However if he hadn't done that I would have been up a card (and would have drawn an extra card turn 3). Maelstrom is all about card draw and momentum. The daemonettes also ensured I wouldn't chase after his Wraith Knight. A lot of moves look like mistakes because the outcome was not favourable, however we often forget that the outcome might have been worse had that move not been made. Another one I can think of is: Why didn't the Eldar player use his objective secure serpents to contest objectives? The simple answer is for the last two turns of the game I had an empty hand, he had no idea what I was going to draw. If he sacrifice units to contest what if I drew cards that scored points for killing? What if I managed to destroy the contesting unit and score the objective anyway? Having an empty hand is very powerful in Maelstrom as your opponent will have difficulty planning around it. On paper I would agree with you. But in practice, The Talos could have danced around that bastion all day avoiding the wraith cannons of the wraith knight. He would have needed to assault them to kill them. In the mean time, the wraith cannons instant kill grotesques reliably, only needing to bypass a 4-5+ cover save depending on which objective I was controlling. The Talos location was also no where near as strategically important. Serpents shields might ignore cover, but don't underestimate the 6+ armour save grotesques get against wave serpents, FNP and WND combined with the fact that wounds tend to get spread across the unit maximising the benefits WND. Again, the Talos survived more shooting than the Eldar player anticipated. If the wraith knight was chasing the Talos, the grotesques would have taken less casualties. As for the warlord, If I was concerned for his safety he just would have hopped over to the other grotesque unit. The Talos were being chased down for Monster Hunter and Overwhelming fire. They seemed like a quicker way of obtaining those objectives than trying to kill the grots, they were also threatening to score any objective cards that I drew for that objective. Neither me or my opponent were expecting the Talos to survive the amount of shooting that it did, combine this with the outcome of the game and it might look like a mistake. But had the Wraith Knight been chasing the talos and ended up on the wrong side of the board resulting in an unfavourable outcome it would have been pointed out as a mistake as well. In Maelstrom missions you have two resources, tactical objectives is the obvious one, the second one is how fast you can complete them and as a result draw more cards. Card draw is really important, a tactical objective that takes three turns to score is a lot less valuable than a tactical objective that takes one turn to score. I'm not trying to dispute your points, I really appreciate the feedback (that's how I become a better player, and also why I put these reports up). I'm just illustrating how these thing are not always as clear cut as they first appear in hindsight as there are a lot of factors in play. As mentioned above, the trick is card draw, be in a position to score as many objectives as possible and discard the ones you can't score in a turn. You get "lucky", by being in a position where you can score almost any card you draw. Can't really think of a more objective secure list than the one above, at the end of the day objective secure doesn't matter, if I can kill anything you send to contest in a single round of assault, I'll kill your objective secure unit, and score a VP. The mission was won on objective placement, If I can control 4-5 objectives and you can only control 1-2 the chances are I'm more likely to be able to draw something I can score. But, it's not just about the outcome, it's about target-priority. The Talos was far less important than the Grotesque squad - it was in a far less strategically-important location, and wasn't in a position to threaten anything (beyond taking pot-shots with its splinter cannon). Bear in mind that Wraithcannons have a 36" range - so he could easily have moved some distance away and continued firing at your grotesques until the turn he charged. I mean, even if he elected to just keep firing at the Grotesques, he could have moved closer to the Talos so that he at least had the option of assaulting it. I agree that the Grotesques were in a more important location. But, that still begs the question of why he didn't shoot all 4 WSs at them (regardless of what the WK was doing). On paper I would agree with you. But in practice, The Talos could have danced around that bastion all day avoiding the wraith cannons of the wraith knight. He would have needed to assault them to kill them. In the mean time, the wraith cannons instant kill grotesques reliably, only needing to bypass a 4-5+ cover save depending on which objective I was controlling. The Talos location was also no where near as strategically important. Don't underestimate the 6+ armour save grotesques get against wave serpents, FNP and WND combined with the fact that wounds tend to get spread across the unit maximising the benefits WND. I do understand that Grotesques are resilient... which is precisely why I would have fired all 4 WSs at them. Sorry, but I'm not seeing how this relates to my point. I'm not trying to dispute your points, I really appreciate the feedback (that's how I become a better player, and also why I put these reports up). I'm more just illustrating how these thing are not always as clear cut as they first appear in hindsight as there are a lot of factors in play. I get that. But, I still question them because I have trouble grasping the logic of them (regardless of the overall outcome). Out of curiosity, is there a reason you chose the Vexator-Haemonculus as your Warlord, rather than the Panacea-Haemonculus? I'd have thought you'd prefer your warlord to be the one with IWND 4+? Also, is there a reason you didn't just give both artefacts to your warlord? Those pot shots scored a VP though by forcing three moral checks (two from shooting, one to regroup when the dire avengers that were fleeing were charge). Sure I might have scored that had the other dire avengers failed a fear test, but the talos force more moral checks and increased my chance of scoring. Leaving the Talos alone would have meant any objective 3 card I drew I would have been able to score, in addition to making cards like Ascension and Supremacy easier to score. Whilst on the flip side making any objective 3 cards my opponent draws involve sacrificing units to get. In addition to the above importantly on CE Turn 3 first blood and Overwhelming fire were ridding on killing the Talos. If anything the mistake was not to use the Dire Avengers to engage it as well as the serpents (as nothing else was in range). The Eldar player was greedy and didn't expect to roll low for his number serpent shield shots. It's relevant because of how Maelstrom works. If the Eldar player killed the Talos on CE Turn 3 he would have been able to draw a new objective card on CE Turn 4. In addition I would not be able to score any Objective 3 cards, and with only one discard a turn my hand could easily have got clogged with cards I couldn't resolve. As for why he shot it turns 4-5 he probably felt rolls would balance out, after all a Talos on 2 wounds seems like an easier prospect than a few grotesques. Had those serpents shot at the grotesques turn 4 I would have had 2-3 left which was enough to kill the dire avengers and score my cards, the warlord could have joined the other unit, if need be. Ultimately killing the warlord was not enough. When we played on passed Turn 5 my warlord and the aberration got shot of the board, and my opponent had drawn assassinate netting him 2VP, but he was still playing catchup. I'll be posting the diagrams for turn 6-7 when I find time to write them up. I'm surprised you haven't picked up on the fire dragons not getting involved in the action against the grots sooner. That's another mistake to add to your list. Good job playing to the mission man. Those pot shots scored a VP though by forcing three moral checks (two from shooting, one to regroup when the dire avengers that were fleeing were charge). Sure I might have scored that had the other dire avengers failed a fear test, but the talos force more moral checks and increased my chance of scoring. Leaving the Talos alone would have meant any objective 3 card I drew I would have been able to score, in addition to making cards like Ascension and Supremacy easier to score. That's true, but leaving the Grotesques alive let you score Objective 2, 4 or 6 (if you drew them), as well as preventing his own units from scoring those objectives (without dooming themselves in the process, anyway). Honestly, I would have been more inclined to use the DAs against the Talos in the first place and try for rends to negate its armour save. That's true, I guess. However, I'm really not a fan of splitting your fire against two very resilient targets - just more chance that both will be left alive. And, in any event, it just seems like he had better tools for the job than those WSs. Yeah, I meant ask about those, but ended up forgetting about them. Seems like your opponent did the same. I couldn't work out why they didn't just go after the Talos. As it was, they got back into their transport and did... nothing. They didn't even get out to shoot the grotesques. I mean, they probably could have killed the Talos with shooting - which would have freed up his 2 WSs to hit your grotesques. Stopping me from controlling those objectives require killing both units of grotesques though, which is easier said then done, seeing as one was still at full strength on turn 5. I guess my point is a serpent on average does 2-3 wounds to a grotesque unit a turn before factoring in WND and rotating your front grotesques and damage being spread across the unit. Because my grotesques came on turn 2 and I was going second, my opponent only had three turns to shoot at them, five if the game went on to turn 7. Killing them all is no easy task, granted shooting at the Talos didn't help the matter. More importantly the whole time those grotesques are still farming victory points until the last one dies. Yup, I would have sent the dragons after the Talos too. Though I think the dire avengers might have taken it out on Turn 3 had they been deployed to do so (in addition to the serpents shooting), the tough thing with wave serpents is their hatch is at the back meaning they don't really have much deployment range when you want to shoot the serpents at the same target as it's passengers. I really thought you were in for a heavy defeat at the start. But with the use of your objective placement you managed to use the card draws to make the game work to your advantage. You had a pretty heavy disadvantage with the lists but playing to the mission was nicely done I really enjoyed the report and keep them coming. That's true. Though, if he'd killed one squad, then you'd be hard pressed to reach all 4 objectives. And, you'd only be able to capture one numbered per turn (unless you detached your haemoncuus). Your objective placement was very clever in this regard. One thing he could have tried (though, granted, it might not have worked) was to use his DA squads to bait your grotesques out of cover. 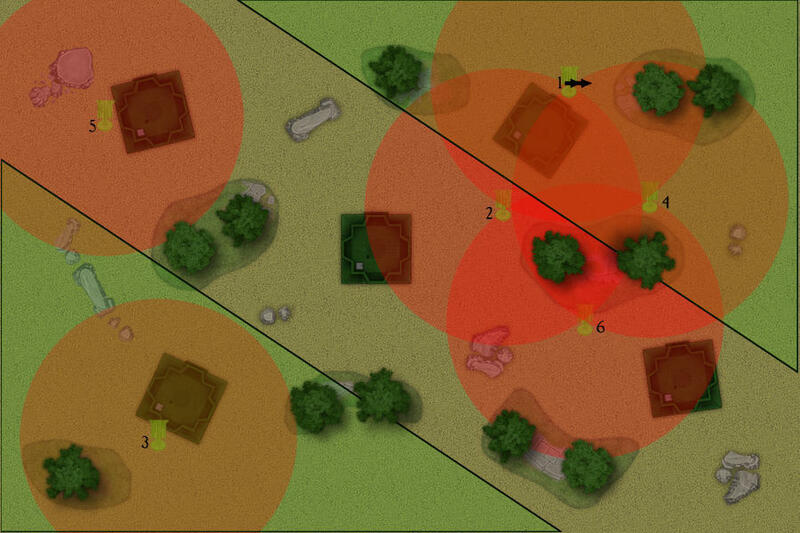 If he'd put a squad 3" from objective 2 (opposite the forest), then you'd have to either accept his controlling that objective or else move out to assault him and likely end up mostly or entirely out of cover. This would both remove your cover save and allow his Wraithknight to assault you with less risk. He could also have done this with objective 6, but that would be trickier due to its proximity to the forest (again, congrats on that placement). But, this is just theorising. The more I look at it, the more I see it almost as an intellectual exercise - how would you go about clearing that many durable models off those clustered objectives? I think leaving the DAs on Objective 5 was a mistake when he could have put a WS there and still make full use of its guns. But, that's a more minor point. With regard to your army, is there a reason you didn't choose the Panacea-Haemonculus as your warlord (or put both artefacts on your warlord)? This isn't meant as a criticism, I'm just curious as to your line of reasoning. I really enjoy your battle reports, Mushkilla! And I have to admit, I love the way you approach the game in general and try out different things (with success ). Thanks, it's something that comes quite naturally when your army has no shooting and little mobility. You don't have the last minute crutch of moving some bikes 48". You have to think several turns in advance and have a game plan. It reminds me of playing dwarves in Blood Bowl. It is one of the things I like with maelstrom as you can always fall back on playing the mission against codices that have units that are above and beyond anything you can field. To be honest it's the most comfortable game I have had against serpents spam in a long time. Sure victory was by no means guaranteed and my opponent made some mistakes. However, I think the serpent spam match up for this list is going to be closer to 50:50 chance of winning than any other pure Dark Eldar list I have run. Wave serpents are popular because they are very easy to get high performance out of due to their consistency and durability. So newer players can pick them up and get good results, and good to great players can really get a lot out of them. I feel the above quote expresses the weakness of serpant spam well. Thank you. I find the best part is that it's surpassingly easy to cluster 3-4 objectives when you don't care where on the board they end up (why having the bulk of your army use WWP is so strong). If your opponent places objectives first you can always get a cluster of at least four. If you place objectives first you can always get a cluster of at least three. Getting a piece of terrain in the middle isn't too hard either. It's one of the core aspects of this armies battle plan, whether it's using the objectives to force the opponent to bunch up for the multiple charge, or just to camp in cover and farm VPs. That sound reasonable. Although when I charge something in that sort of situation I move as many models as possible in the opposite direction in the movement phase, leaving one or two models 2" away from the target. The charge roll tends to be low combined with difficult terrain, and most of the models will be able to stay close enough to the cover even after piling in that a 2" consolidate will see most of them back to safety. I think a manticore or two wouldn't go awry in that department. Thankfully camping on objectives all game isn't how I would play this list in the Astra Militarum matchup. Agreed. Although I wouldn't have but the serpent on the objective per say just made sure it was close enough to score it. That way it could still get it's scatter lasers in range of the grotesques, and avoid the line of sight problems caused by the terrain. Honestly, they are just filler, I am considering running the haemonculus without any upgrades (not even scissor hands). Call me a Scarlet Epicurean but this game taught me that haemonculus are expendable, so giving them anything other than a WWP seems gratuitous. It's a shame they can't take venom blades though... they are cheap enough to consider. As for only one artefacts on one model, we have a house rule for that (keeps all codices inline in that department). I'll be making a few changes to the list next game, not sure what yet though. As for the game itself it will probably be against Tau. How is it that you are allocating wounds around the grotesque units? And i assume the re-shuffle for IWND is just moving the wounded to the back once they are down a couple? I was thinking about your list and something popped into my head, i feel that if you were to upgrade to a higher points level you'd still be very limited in that you can only really bring more grots or talos\cronos. My reasoning being; your strengths in objective games are that you effectively only have 3 units, each which is rather durable, this allows you to negate the opponents ability to pick off a weak unit when they draw a kill a unit card. They also dont currently have much choice in whatvto shoot either and to top it off assault will be ugly whatever they throw at you. if you brought anything that was not as durable then you'd in effect create a weak link within your chain. What are your thoughts? A minor, unimportant detail, since it never became relevant, but Talos cannot take razor flails. They can only take chain-flails. Your list has really impressed me. Your first battle report I figured you just went lucky with a well suited opponent, but this one was inspiring. Opponent faults or not, taking down serpent spam is no menial task. I've given expansion some thought (as my local meta never plays below 1500 points), and this is my suggestion for 1750 points of Coven. It does, however, benefit from 3 different "Freakish Spectacles". You lose out on one Talos, but gain the threat of another Dangerous WWP'ing unit. The Fleshcorps is there partly to add the second Haemonculus for your second Grotesque unit, and partly to add some much needed manuverability to the list. Plus the 3 dark lances probably wont hurt either. On the downside, there will be some easier options for kill points with this list, which is one of the major advantages of your current list. Thanks for the awesome report again Mush! The game ends. Both sides score Line Breaker. I can see those serpents but yours? I would have charged the WK in to those Grots. It was not in it's best game here. That way it should have tied the other grotsquad for a turn and killed a few grots before going down. If it had managed to land charge at the end of grot chain perhaps even two game turns of tying those expensive units. That would probably be better. (Probably) killing 2 on shooting, 1 on Hammer of Wrath, and realistically 3 in combat. This leaves just 17 return attacks from the grots, 8-9 hits, 4-5 wounds. 1-2 goes through. Granted, it might be instant killed, but getting the Grots removed in piles is worth the risk, imo. Different units shooting from different angles tend to hit different grotesques. Combined with rotating wounded models to the back as you described (or to the front depending on whether your opponent is going to be firing S10 weapons at them first). My reasoning being; your strengths in objective games are that you effectively only have 3 units, each which is rather durable, this allows you to negate the opponents ability to pick off a weak unit when they draw a kill a unit card. This is actually a great point! I didn't even think about it that way. Here was me talking about tactical objective card draw (scoring objectives quickly) and objective placement, when I completely missed the fact that my list in itself was making those cards very hard for my opponent to score quickly! That's quite clever, thanks for pointing it out. In an age before wave serpents and Wyverns I would have said some small mobile units that can dance around at range. However, as you pointed out one of the strengths of the list is the lack of easy kills (be it kill points, first blood, slay the warlord or tactical objectives). In that regard I will probably be sticking within the confines of the coven supplement. Dark Artisan and the other formations give me a few options, cronos are also something I would like to try and work into the list. Yeah that was just me mistyping I meant chain-flails! Though I am considering ichor injectors. Thanks Sigmaril. Honestly the list did a lot better than I expected it to do too! That being said the list isn't out of the woods yet. There's still Grey Knights and Imperial Knight lists that are both going to tough match ups. The list has one self imposed limitation (no vehicles). In addition as you mentioned adding easier for options for kill points weakens one of the main strengths of the list. So in that regard I would be more likely to go with your second list (the "keep it simple" list). Though, corpsethief and cronos are both things I'm considering at those point levels. Oops... Thought it was deployment zones for some reason (fixed that). That's another good point. I can only reason that the fear factor of flesh gauntlets put my opponent off. I'll have to be more cautious in future with grotesques in the open. On a side note I'm loving the fantastic feedback I'm getting from everyone! It really helps me improve as a player and refine my list. Thank you and keep it coming! Hey mush!!! Love your reports! It seems with expanding your list the two major obstacles are imperial knights and grey knights, just like you said! It seems the best solution for the grey knights is the Dark Artisan formation since the +1In would really help strike first against force swords and the FNP buff would help the Grotesques as well... but it would just be D weapon fodder for imperial knights... maybe talos/ corpses thief claw with haywire blasters? But they would get munched by grey knights hammerhanding with force active... hard for me to see a solution for both..
Just a quick list update I'm dropping all the scissor hands. I initially took them to deal with walkers, but realistically an aberration on average scores 0.41 rends, taking 7 turns to deal with a 3HP AV12 walker is not realistic. I think I'm better off saving the points and finding a way to play around them. It's kind of like having 1-2 melta guns in a list and saying that it means your list can deal with AV14, it's a deliberate delusion that will only get me to make mistakes on the table by luring me into a false sense of security/hope. It seems the best solution for the grey knights is the Dark Artisan formation since the +1In would really help strike first against force swords and the FNP buff would help the Grotesques as well... but it would just be D weapon fodder for imperial knights... maybe talos/ corpses thief claw with haywire blasters? But they would get munched by grey knights hammerhanding with force active... hard for me to see a solution for both.. I am considering Dark Artisan, especially now that I can fit it into my 1250 point list (since I'm dropping the scissor hands). I5 is very useful against Grey Knights (and I4 walkers) that's for sure and I'm trying to fit a cronos into the list too. Like you said I'm less concerned about the Grey Knights (mainly because I play them). The chink in their armour is that they will only ever get hammer hand and force active on 2-3 units at the most, and that means not casting other powers like prescience. Dreadknights don't have assault grenades so strike at I1 through terrain. Perils almost always kill a terminator, putting all my deny dice into blocking a single casting of force will push him to use more dice and as a result restrict the rest of his casting (a GK unit without force/hammer hand will be slaughtered and with the changes to the psychic phase in 7th they both need to be cast pre-emptively). My army isn't on the board until turn 2 at the earliest, and I like going second meaning he only has turns 3-4 before I get eternal warrior. Imperial Knights are more of a concern, I doubt I could take on adamantine lance at this points level, but I will be happy with being able to take on a list with a single knight. I'll bear that in mind if I ever use a slow, tough list. To be fair, though, many armies don't have Manticore-esque firepower (we certainly don't). I am curious, though, how would you play this list against mech-IG? Would you deep-strike as close to his vehicles as possible and dare him to fire his blasts at you? I think you mean "were", Venom Blades are now no cheaper than Scissorhands. Though, I too would like them back (especially on Archons).